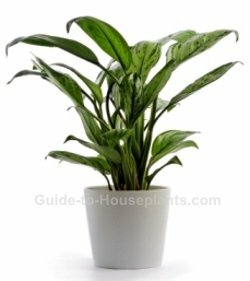 Chinese Evergreen is a member of the Aroid family (Araceae), known for easy-to-please foliage house plants. A very adaptable plant, it tolerates low light and dry air better than most other house plants. One thing it doesn't like is cold air. Keep your plant away from drafts and A/C vents and it'll do just fine. Chinese evergreens are among the best plants for removing toxins, such as formaldehyde, from tainted indoor air. As if their good looks weren't enough, their air-cleaning abilities make them must-have house plants. 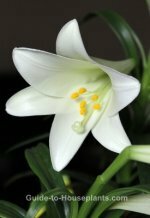 Its large, pointed, dark-green leaves are 6-10 inches (15-25 cm) long, 3 inches (7.5 cm) wide, and heavily marbled with white, cream or silver and white. New hybrids and cultivars are developed all the time, giving us more beautiful choices than ever before. You have a wealth of varieties to choose from: 'Silver Queen' and 'Silver Spear' have silvery variegation that makes them stand out among group plantings. 'Emerald Star' has bright-green foliage speckled with white. 'Silver Bay' is generously splashed with creamy white. 'Firecracker' is boldly mottled with fiery red. Choose the one you like, they all make beautiful house plants. As it ages, expect some of the lower leaves to drop off, making it look spindly. Newer varieties of this plant grow in thicker clumps, so mature plants stay compact and bushy. 'Silver Queen' (shown below) is a compact variety. Small flowers may appear in summer, followed by red berries. The berries and sap of this plant are poisonous. Water regularly. Consistently moist soil will keep this plant happy. In fact, it can grow in water alone. Don't prune. All new growth is from the crown of the plant, so don't prune it back or you'll kill it. If it begins to look leggy, plant pothos -- or some other low-light plant -- in the same container to cover the bare stems. Repot in spring when it outgrows its pot. Aglaonema likes to be slightly root-bound, so it's a good idea to move to a pot that's slightly larger. Use a container with drainage holes to prevent soggy soil. Light: Keep this plant in low light. Too much light may cause its leaves to fade. Water: Keep potting mix evenly moist. Don't allow it to get so dry that its leaves wilt. Water thoroughly, then empty the drainage tray. Humidity: Average indoor humidity levels. It will tolerate low humidity. Don't mist, which will cause spots on its leaves. Temperature: Normal room temperatures 65-75°F/18-24°C. This plant has no tolerance for the cold. It suffers when exposed to temperatures below 55°F/13°C. Cold air may cause grayish-yellow patches on its leaves. Put your plant in a spot where it won't be exposed to cold drafts from doorways or windows. Soil: Any good-quality potting mix. Small plants can be grown in water. Propagation: Easy to propagate by stem cuttings or root division. You can root them in water or moist potting mix.